or read a little before. Together we can try to understand how the Euro diffusion takes place. It is probably the biggest statistical experiment that was ever made - and you are part of it! Many people tell us about the European coins they have in their purse. We analyze the data and publish the results. Every country has produced different Euro coins - and by telling us the backsides of your coins, we know how many of each sort has arrived at your place. The final situation in your purse will mirror the production distribution, but nobody knows yet how this process evolves. 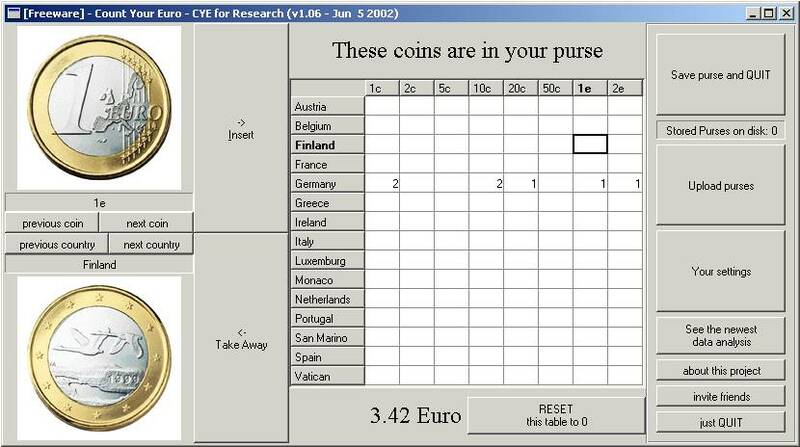 input the coins of your purse at that moment. directly upload the data to the server. C) It is also important that you advertise the project among your friends and colleagues. With your first upload, the server will give you a unique membernumber which you tell them. With this number, at a later stage, you can see how far your influence has spread over Europe. D) Of course, we analyze the data as soon as possible - and return the results to you. Wanna know more? Start over again on the Homepage.